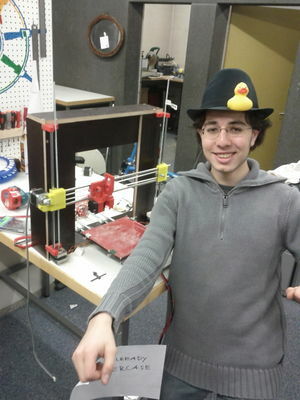 Our 3d printer based on the Prusa i3 design. Lightweight stepper/extruder is working and so the machine is functional. However it cannot yet be used for prints large/lengthy prints. The glass plate is warped, resulting in bad prints and the stepper on the extruder gets very hot. We use the slicer software called Slic3r - it will generate the actual printer commands (G-code). The gcode produced by our slic3r configuration will automatically 'home' the printer before it prints, and once its finished printing it will move the nozzle to X0, turn the hotend temperature down to 160 and turn off the motors. We use Pronterface to print. hit print and it should do its work. it can take upto 5mins before the printer actually starts printing. if the printer breaks or isnt printing correctly notify the maintainers. do not try to fix it. this is not because you dont have the ability to, but because the maintainers have a 'history of care' and want to identify recurring issues and hopefully fix them. Maximum print sizes: (x,y,z) - 170mm, 170mm, "a lot"
note the printed object will suffer from "warping" much before those limits are reached. It can print overhangs of less than 45degrees without scaffolding. Settings for the printer depend on the kind of filament. This page was last edited on 26 October 2015, at 19:41.